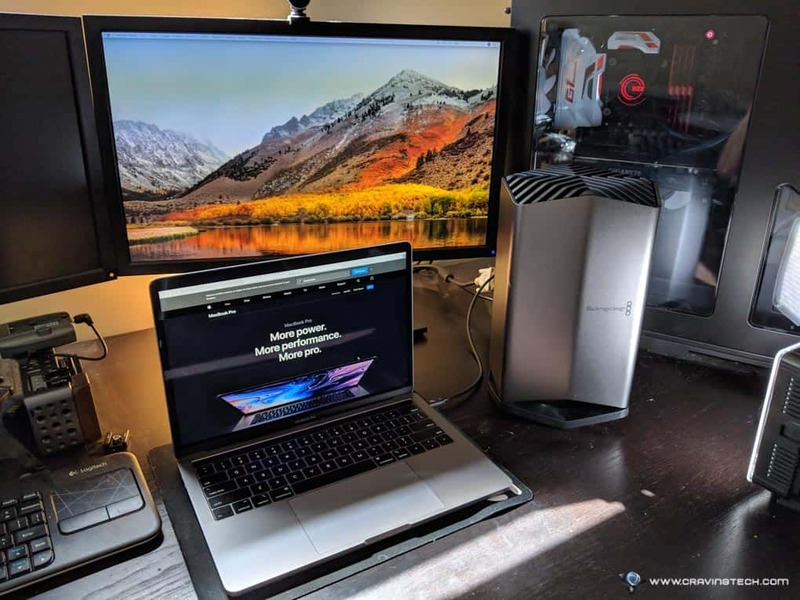 Apple Macbook Pro 13″ 2018 Review – I bought my last Apple product in 2009 (a black MacBook) and it was a necessary purchase for my work at that time as a software developer. My wife uses the iPhone and iPad as her daily drivers though, and she is pretty happy with Apple products being so easy to use. Michael is also on his iPhone X (and iPhone Xs Max soon which he’ll be reviewing here). Apple has gladly loaned me their latest Apple Macbook Pro 13″ 2018 running on a quad core processor, which piqued my interests. The best thing I like about Apple products is the display and the new MacBook Pro 2018’s display is nothing short but amazing. It has this top notch, premium panel (Retina display) which is capable of displaying vibrant colour that is rare to find from other brands. It is definitely the ‘wow’ factor each time you open the lid up. This year, the MacBook display is an LED backlit panel with IPS technology that can display a wider P3 colour space (which is quite common in cinema industry) and has a display resolution of 2560 x 1600 pixels. Apple has also introduced a new True Tone technology that calculates light ambience from the environment and adjusts the display’s white balance and brightness automatically. All these should make video editors, film makers, and graphic artists happy. A nice addition from the MacOS is the night shift feature that moves the colour to a warmer red channel that is scientifically proven to help you wind down at night. At a glance, the new Apple MacBook Pro 13″ 2018 maintains its grand impression over the decades to show aesthetic and luxury statements to whoever carries one. The simple and yet, solid precise aluminium construction is now available in Silver or Space grey profile. The Apple logo no longer lits up and is replaced by a mirror with an Apple-shaped logo. Starting the latest macOS up for the first time is a completely different experience from the operating system I knew and used 7 years ago. The MacBook Pro starts as soon as I open the lid up. There are several setup steps to go through such as training Siri to recognise my voice, setting up my fingerprint for Touch ID and also setting up an Apple iCloud account (if you don’t have one yet). It’s nice to see Apple providing local resource references to whoever is new to the operating system. The Apple MacBook Pro 13″ 2018 keyboard typing experience is definitely up to my preference, thanks to the very short travel distance between keys. The switches are quiet, and the backlit is bright. There is an ample amount of space on the Touchpad and it doesn’t feel cramped at all. It is also fingers-responsive and smart enough with palm rejection to avoid accidental presses. I love the front facing speakers, which are excellent for multimedia consumption. The sound clarity is excellent and I can tune the volume up to stupidly loud. Say goodbye to muffled sound while placing a laptop on a table or on the lap. Apple has replaced the dedicated function keys with touch sensitive bar containing ‘shortcuts’ which are context specific to what you’re focusing on at that moment in time. Most apps that I used during my review utilised the touch bar and I’d get different options as I worked through different programs. For example, the touch bar would show a playback slider when I was watching YouTube videos, an Emoji selection when I was in Messages, or Months selection when I was in Calendar app. 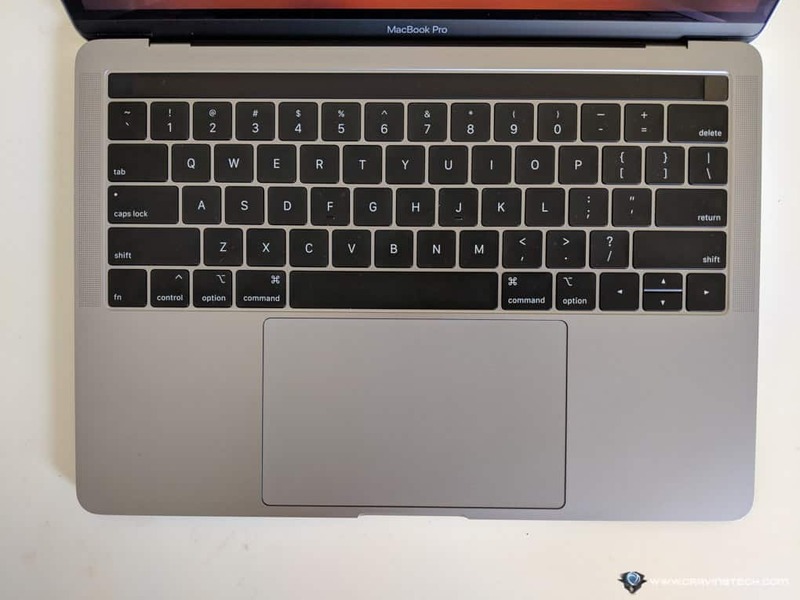 The Touch Bar is convenient and serves as an alternative to touch screen displays that tend to leave smudges and fingerprints (a let down to the display aesthetic). Like the iPhone and iPad, Apple MacBook Pro 13″ can log you fast with just a fingerprint. Touch ID can also be used to make online purchases and access your passwords in the password manager. The webcam is a standard 720p webcam to be used for video calls, etc. Nothing exciting here. 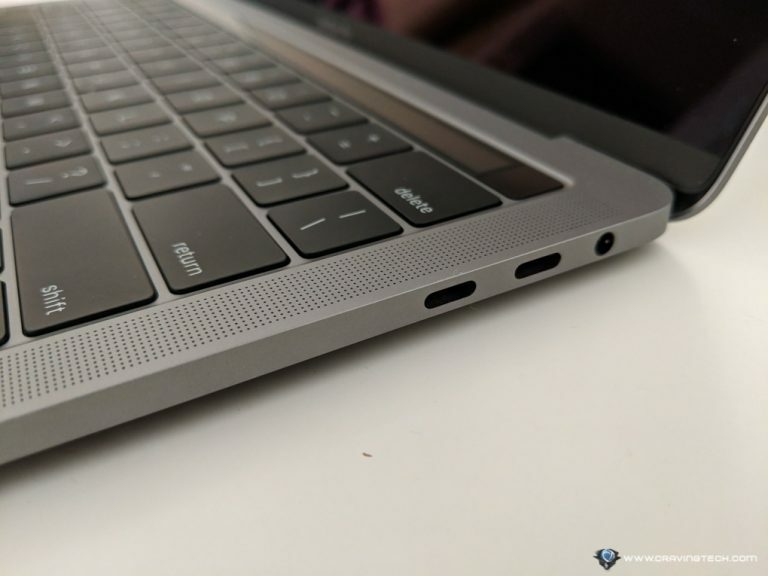 Apple MacBook Pro 13″ comes with two or four USB-C ports (all Thunderbolt 3 enabled ports) depending on the model you get. 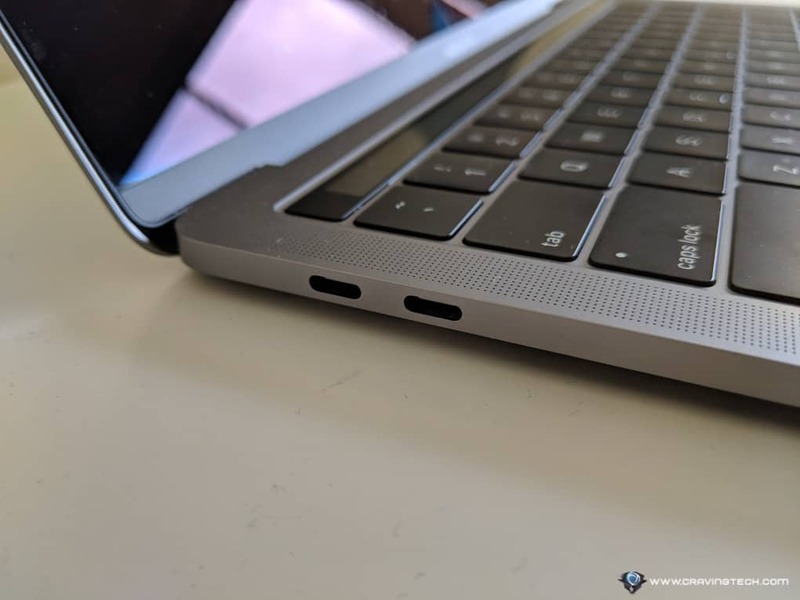 These ports are capable to charge the Apple MacBook Pro, extend the display up to two 4K resolution, and have a super quick data transfer speed. The battery is definitely impressive as I can get around more than 8 hours of battery life with random use of internet browsing, emailing, and photo/video editing. The battery charger is 61W and utilises the USB-C port to charge. The size of the charger is a little big but I could comfortably leave it at home, knowing the laptop will last. 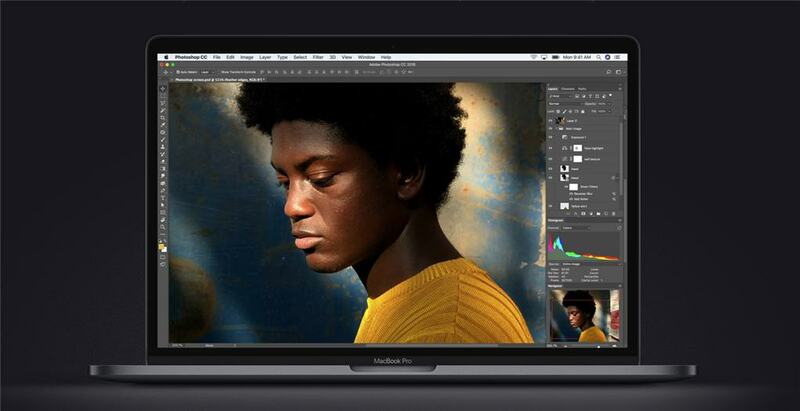 Out of the box, Apple Macbook Pro 13″ quad core processor delivers capable performance for creative artists that do photo and video editing on the go, also thanks to the Intel Iris Plus onboard graphics. A separate accessory available for purchase worth mentioning is the Blackmagic eGPU. It’s an external graphic processing device giving an option to dramatically supercharge MacBook’s graphic processing capabilities and can also be used to charge the MacBook with 85 Watts of charging power. Serious power! 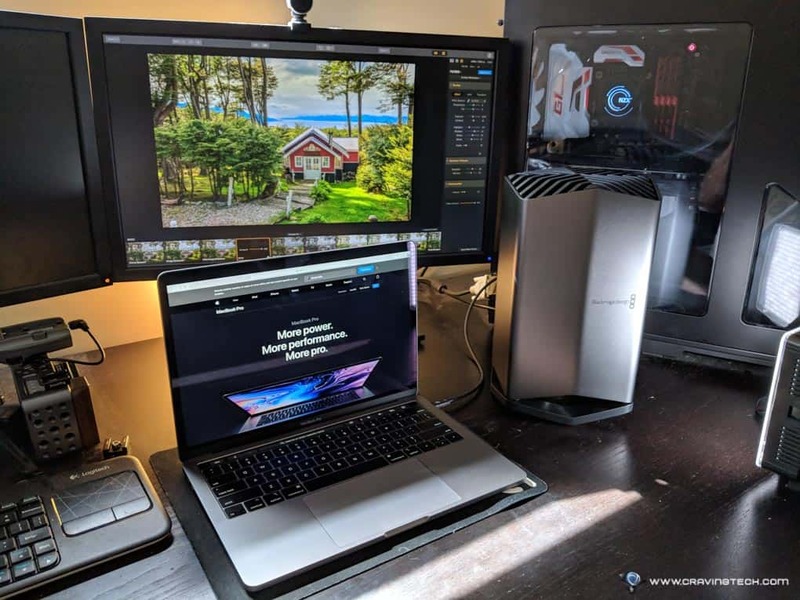 With this versatility, you can carry the MacBook Pro around for your daily tasks and plug the Blackmagic eGPU at home for the extra kick on graphics performance to do more serious work, like photo or video editing. Blackmagic Design is an Australian company focuses on creating products for the digital video industry. I own one of their cinema cameras and they also provide innovative products related to video production. 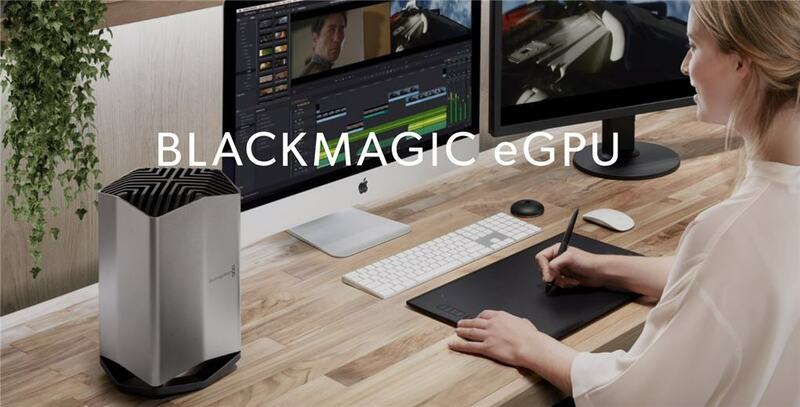 Blackmagic eGPU hardware has a modern design similar to Apple’s aesthetic and comes with a solid construction of aluminium material. It has a balanced weight with rubber feet to make the device stay in place. At a glance, the case looks like a giant heatsink, but this allows heat dissipation from the bottom to the top. Installation is pretty easy and straightforward: Plug to power socket with the included power cable and then connect to a monitor via either HDMI or USB-C. Once connected, plug the supplied USB-C Thunderbolt 3 cable to the Apple Macbook Pro 13. The MacBook would recognise the Blackmagic eGPU device immediately and kick start both Blackmagic eGPU and the monitor couple of seconds later. I don’t need to do anything from the software perspective. Simply plug, and play. By default, macOS extends the monitor as a second monitor. 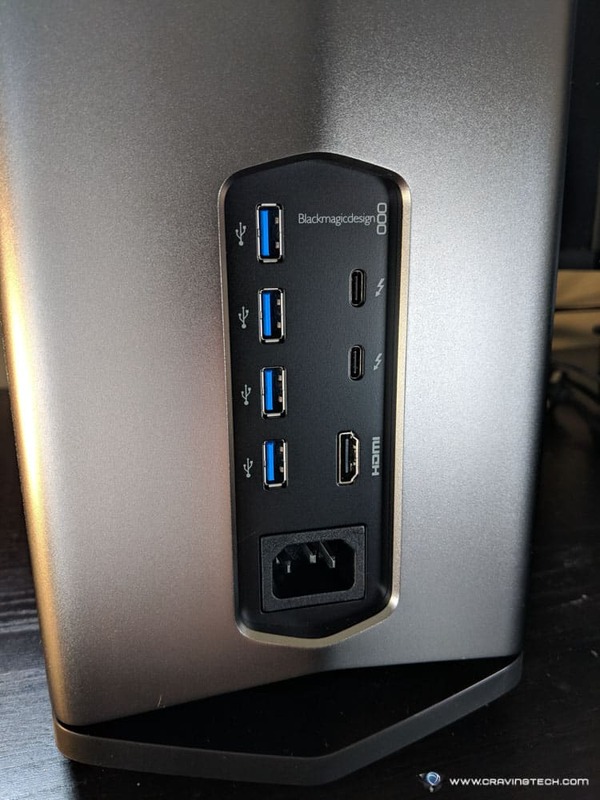 Keep in mind that in order for an app to maximise the benefits from any eGPU, you have to use the app through a dedicated monitor connected to the eGPU. Hence, the bandwidth to transfer data from Thunderbolt 3 is not wasted. 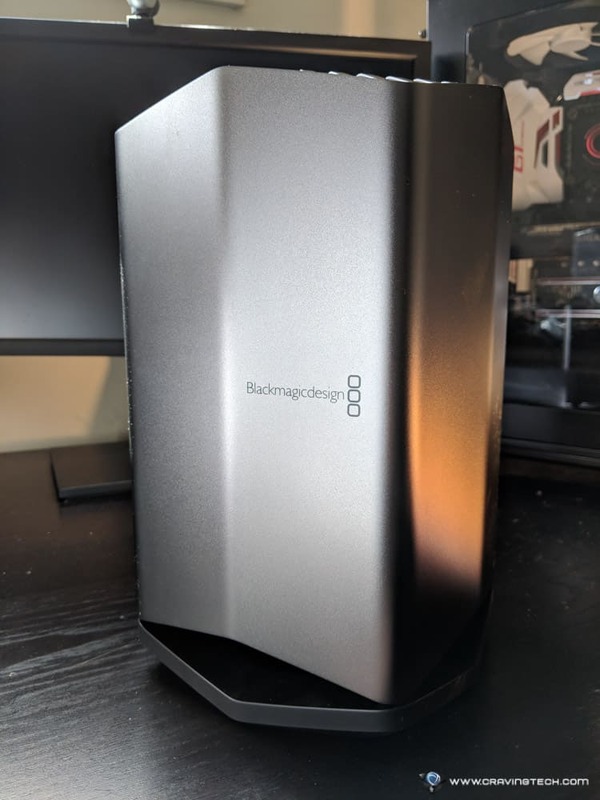 I notice the Blackmagic eGPU operations to be quiet, but not dead silent. With the dedicated eGPU, Performance during photo editing and video rendering is significantly improved. Guild Wars 2, a good old game that I’m still playing, runs much smoother too. Only a few clicks needed to disconnect Blackmagic eGPU from the Macbook, like what you do with a USB drive. I did make a mistake of unplugging its cable from the Macbook while the monitor was still active and MacOs warned me not to do that. Apple Macbook Pro 13″ is a tool for creative artists on the move but for some reason, it does not have a dedicated SD card slot reader. SD card is still common these days and it’s versatile enough to accept microSD with the help of an adapter. Sure, I could buy an external SD card reader but I really wish it’s built-in. Surely I’m late to notice this from many of the last MacBook Pro generations. Having all USB-C ports are totally great but personally, I think Apple should make a MagSafe power adapter available through USB-C port. MagSafe was a great solution to stop bad cable tripping accident from kids running around while you are on a deadline, which leads to my next point. Apple Macbook Pro 13″ 2018 Review – Who is this for? Apple MacBook Pro 13″ 2018 offers a range of various financial commitments to own. Starting from 1,899 AUD, you’re getting a gorgeous display by default but without the True Tone technology, Touch ID and Touch Bar. You’ll also get two USB-C ports (instead of four), a dual core processor, and 8GB of RAM. Our review sample is an all-maxed-configuration with all bells and whistles: 2.7 Ghz quad core processor, 16GB of RAM, 2 TB super fast storage, four USB-C ports, Touch ID and Touch Bar cost at a whopping 5,599 AUD which definitely is targeted for professionals. You can get similar processing power configuration with smaller storage options for more affordability though: 256GB for 3,499 AUD and 512GB for 3,799 AUD. Check on Apple’s website to find the right configurations for you. Apple MacBook Pro 13″ delivers a good balance between hardware and portability. It is lightweight and has an excellent battery life which is enough for an entire day. 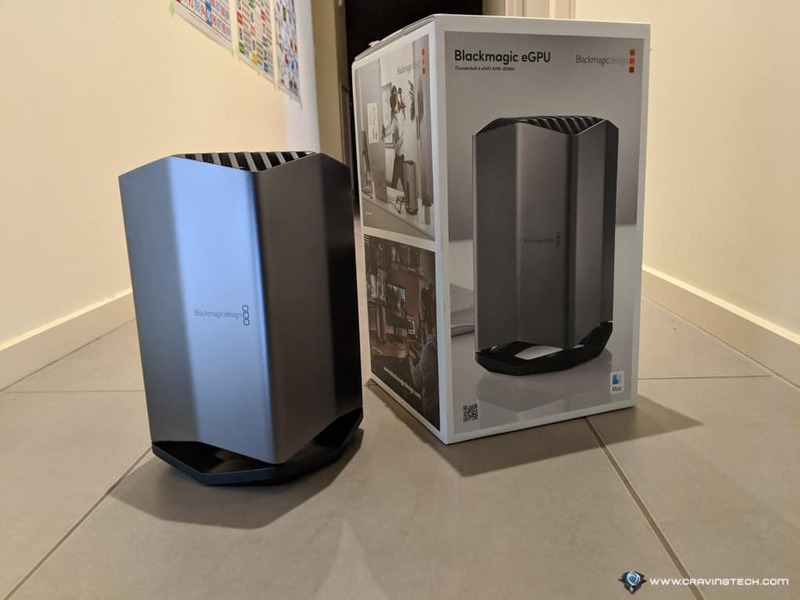 You can extend the Macbook Pro 13″ graphic capabilities further by getting the Blackmagic eGPU but it will cost you 1,149 AUD extra. Still, it’s a great complement to an already great machine.